Weight 8 lb 6.5 oz. She is growing, but her growth percentiles are around 14-16%. 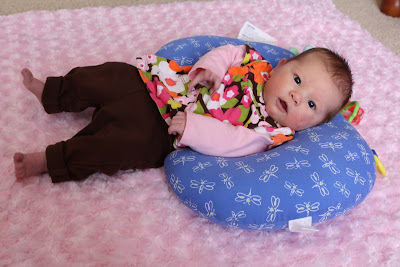 She can still wear her newborn clothes, but her 0-3 month clothes are fitting her better now. The outfit above is 0-3 months. She is wearing size 1 in diapers. She is a lot more awake these days. When she first came home, it seemed like she was only awake for maybe an hour each day. Now she's probably awake maybe 4-5 hours a day, and she is wanting to be held more. She frowns when she hears loud noises and she's trying to nap. She doesn't seem too fond of her brother because he's always being loud. This is about as much as she can lift her head. 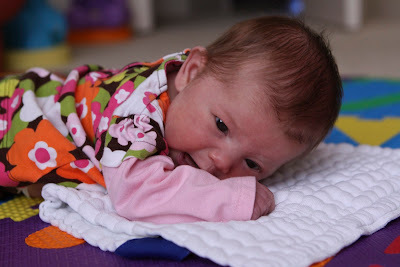 She's still doesn't really like being on her tummy.